If your idea of fun outdoors in Great Smoky Mountains National Park involves splashing, dunking and floating, then grab a tube—or a helmet and life vest—and hit the river! 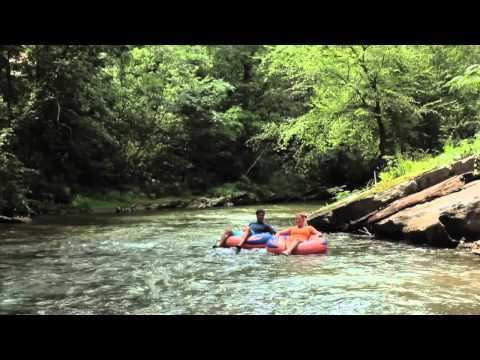 Mild-mannered river explorers should try tubing down the Little Pigeon River with River Romp, a well-established, family-owned and family-friendly business.Tubing down the Little Pigeon River offers the scenery and peacefulness of a secluded mountain river. River Romp is one of the best-kept recreation secrets in the area. The tube route is about 2.4 miles down the river, and takes between one and two hours—tubers can do the trip as many times as they like in one day. The trip is a smooth, relaxing float, and tubers can bring their own coolers for refreshments. There are five sections of light, Class 1 rapids—quite tame and a lot of fun. River Romp also rents kayaks for those who prefer to paddle down the river. For a wilder ride, try the whitewater-rafting adventure with Rafting in the Smokies. Rafting in the Smokies offers no-experience-necessary trips for ages 3 to 93. Their Upper Pigeon whitewater trip is 5 miles and 90 minutes of adrenaline-pumping rafting featuring 12 Class III and three Class IV whitewater rapids. Professional river guides lead all trips. The rafting season is March through November, so your window is wide open, but reservations are required. If you’re planning a vacation to the area and this sounds interesting, the sooner you call the better. The minimum age is 8, the minimum weight 70 pounds. Rafting in the Smokies also offers a Lower Pigeon River Float trip designed for children too small or young for the Upper River trip. The trip is ideal for children 3 and up and for grandparents or folks that would prefer a relaxing float. Trip times can be coordinated for families who wish to do the upper and lower routes at the same time. If you’d prefer to enjoy the river from the shore, grab a rod and reel and test your fly-fishing skills with The Smoky Mountain Angler, Gatlinburg’s oldest fly-fishing outfitter and shop. Trout is abundant in the Smokies, and this expert, authorized fishing guide service can provide all the gear you’ll need to catch a few from the mountain streams or local stocked waters. Rafting and fishing are two of the most enjoyable vacation activities in Great Smoky Mountains National Park, but there are countless others—hiking, biking, birding and more, not to mention sightseeing in towns like Pigeon Forge and Gatlinburg. Sample as many as you can to make the most of your vacation.